Not content with the slew of digital cameras announced today, Canon has also released details of its latest camcorder line-up at CES. The 10 new camcorders from Canon cover the whole video-shooting spectrum, from standard def right through to professional-quality capture. Entry level camcorders in the Legria R-series will enjoy new HD-shooting models for the first time movie maker, specifically the Legria HF R28, R26 and R206 models. New models in the Legria M-Series, the HF M41, HF M46 and HF M406, all feature the professional-standard HD CMOS Pro Sensor for hearty low-light shooting and wide dynamic range. It's not all about HD though, with the Canon Legria FS400 featuring as Canon's smallest ever standard-definition camcorder, while the Legria FS46 and FS406 also pose as affordable options for standard-def video capture. The expert-grade Canon XA10 is also highly compact, offering full manual control and professional audio features. 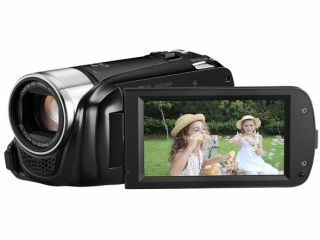 The new camcorders join the top-end flagship Legria HF G10 on the shelves at some point this year; unfortunately neither the UK release date nor UK pricing have been revealed as yet.